Around New Zealand, this scenario is increasingly unlikely. 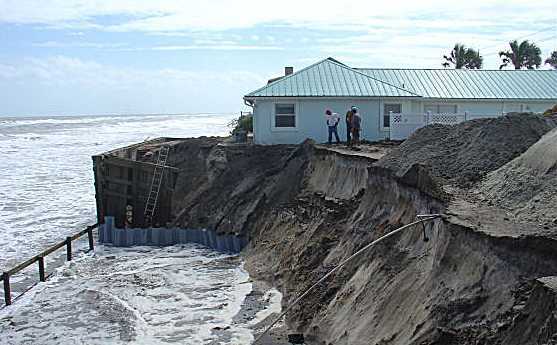 However, notice that this house was built upon sand. It’s fate was, therefore, entirely predictable, and has nothing to do with man-made global warming. NZCSC chairman Barry Brill has suggested to Environment Waikato that its Regional Policy Statement (RPS) should not be influenced by the climate change ‘Guidance Manuals’ (here and here) issued by the Ministry for the Environment in early 2008. Like the IPCC’s Fourth Assessment Report (4AR), their recommendations have been overtaken by recent scientific papers and data. His submission notes that modelled projections of 21st century warming rely upon two components – emission volumes and climate sensitivity. Here is his comment regarding future CO2-e tonnages – or, in other words, emission volumes. In 1998, the IPCC commissioned consultants – economists, futurists, statisticians, demographers, etc. – to establish story-lines of how the world might develop over the following century. This group eventually brought out a detailed book, the “Special Report on Emissions Scenarios” (“SRES”) of 40 diverse story-lines, any of which might conceivably capture the emissions profile of the 21st century.